A range of hand-held resistance thermometer probes, for general purpose temperature measurement. Intended for use with a hand-held digital thermometer. 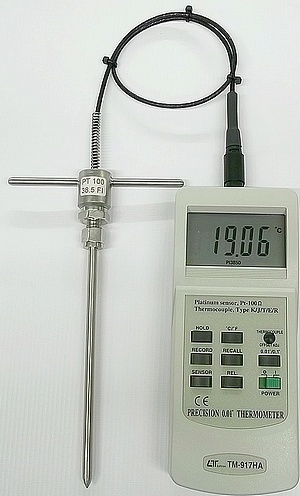 A 4-wire Pt100 hand-held temperature probe, consisting of a Class A Pt100 bulb in a 3mm diameter, 150mm long, mineral insulated 316 stainless steel sheath, with plastic handle and 1m of PTFE insulated lead, with bare tails or connector. Warning! These probes are delicate, they should not be dropped or bent within 50mm of the tip as this is likely to cause damage. Any physical damage is not covered by the TMS warranty. Highly accurate probe with a 4-wire PT100 Sensor housed in a Stainless steel 6X150mm Spike T handle sheath. 500mm of PTFE lead terminating in a 4-wire plug which is suitable for our TM917HA Precision instruments. Often used for checking chilled meat temperature.